"The Official Bubble Gum of RIPKEN BASEBALL", here is a massive pack of gum to keep you blowing bubbles for hours. 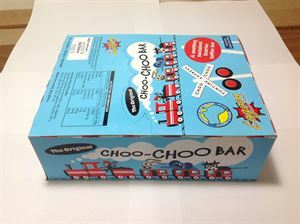 Ingredients: Sugar, Gum Base, Corn Syrup, Glycerol, Less than 2% of: Natural and Artificial Flavors, Soy Lecithin, Aspartame, Aspartame-acesulfame salt, Colors (Red 40, Red 40 Lake), Corn Starch, and BHT (to Maintain Freshness). From the UK. The five boys story. Anticipation and excitement when they found out they were getting "Fry's" chocolate. It's a lovely chocolate with a beautiful cream centre. 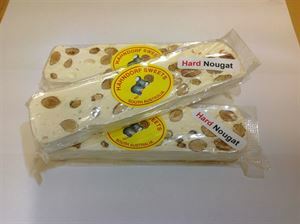 Locally made by a retired Italian gentleman.Original Hard Nougat. He describes it as a special treat when he was a small boy. His parents would take him to the football,(soccer), and at half time Mama would bring out the Hard Nougat she made, shaped like a pizza, and break it into little pieces for the family to snack on. This Nougat will bring back memories.